Several years ago, my mom lent me her little cookbook called The Herb Cookery for ideas on different ways to use fresh herbs. Needless to say, that cookbook is still on loan, and as my herb garden grows bigger every year, I need more ideas than ever. 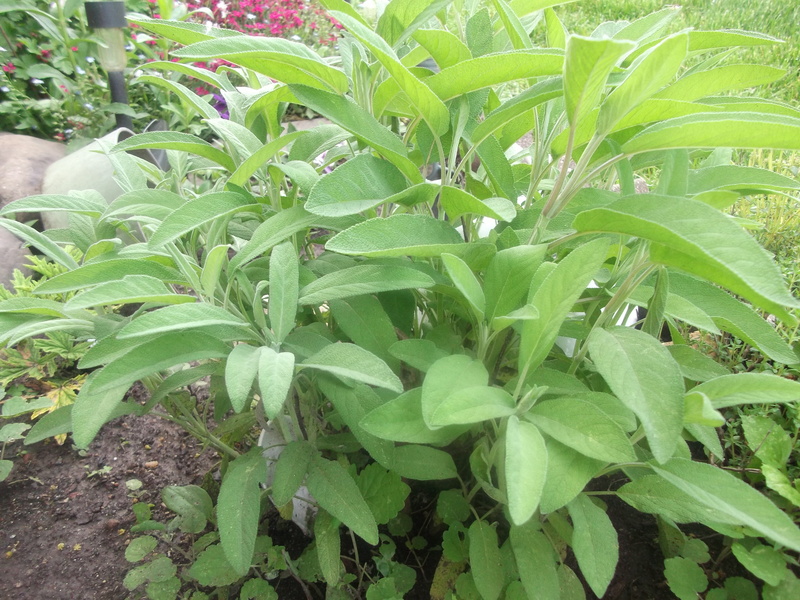 When my sage was growing like crazy and threatening to take over the neighboring herbs, I sought some sage advice from the cookbook. (Pun fully intended.) 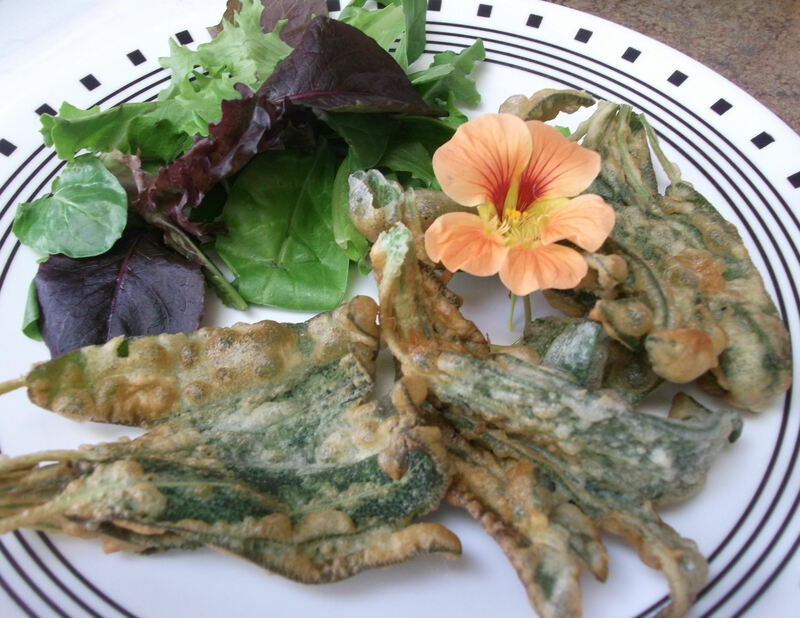 This recipe for sage fritters caught my eye, and while I was leery of eating sage leaves pretty much on their own, I was amazed at how the cooking process really neutralized the otherwise overpowering flavor of the leaves. Wash the sage leaves and blot dry with paper towels. In a small saucepan, melt the butter in the water. Add the flour, milk, salt and egg and stir until the batter is thick and smooth. Adjust salt to taste. 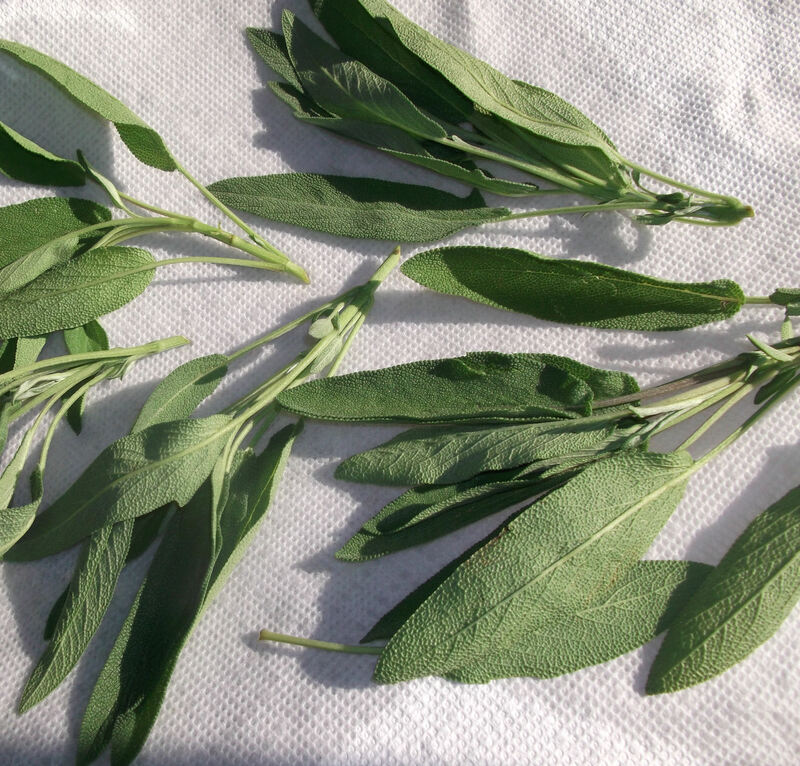 Wash the sage leaves and blot dry with paper towels. In a small saucepan, melt the butter in the water. Add the flour, milk, salt and egg and stir until the batter is thick and smooth. Adjust salt to taste. I poured my batter into a bowl, but you can leave it in the pan and dip from there. Heat the oil in a skillet or small saucepan until shimmering. 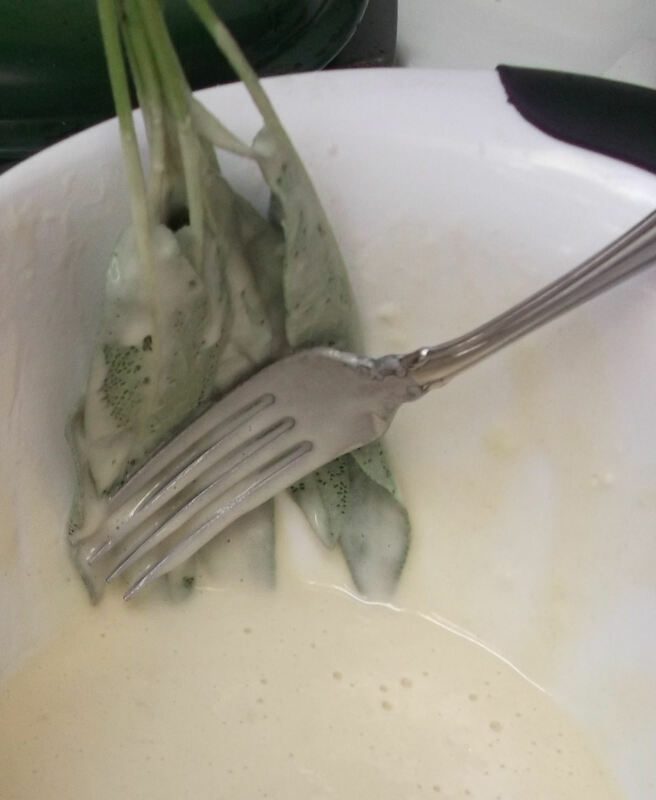 Dip the sage leaves—either individually or in clusters (making sure each leaf is coated)—in the batter and shake off excess batter. I scraped the batter off using the back side of a fork pressed against the side of the bowl. Fry a few leaves or clusters at a time, turning to evenly cook both sides. If using a saucepan, you can use either method; however, if you are using a skillet, you probably need to fry the leaves individually. 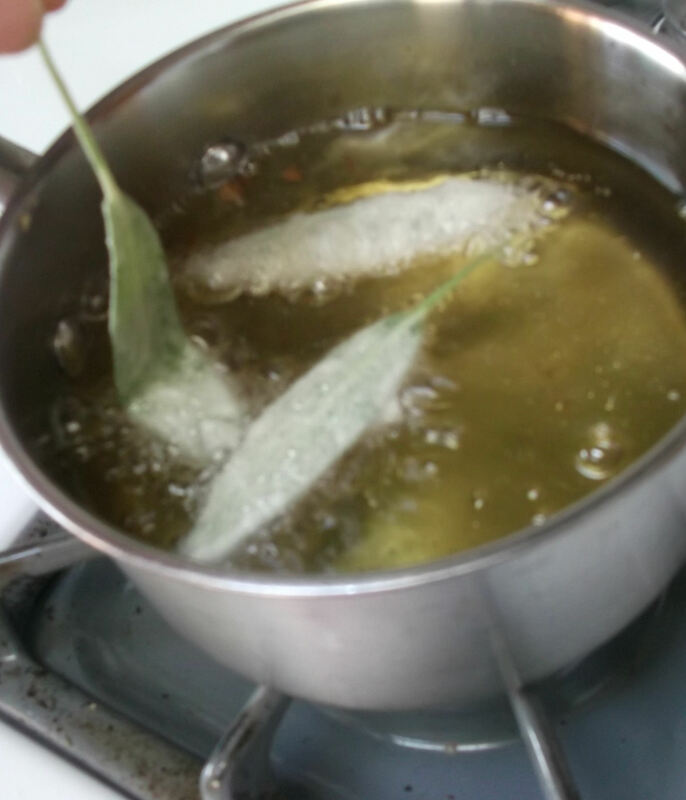 After frying individual leaves, I thought it might be easier to just coat a cluster of leaves and fry the sage that way. It worked and was much quicker. 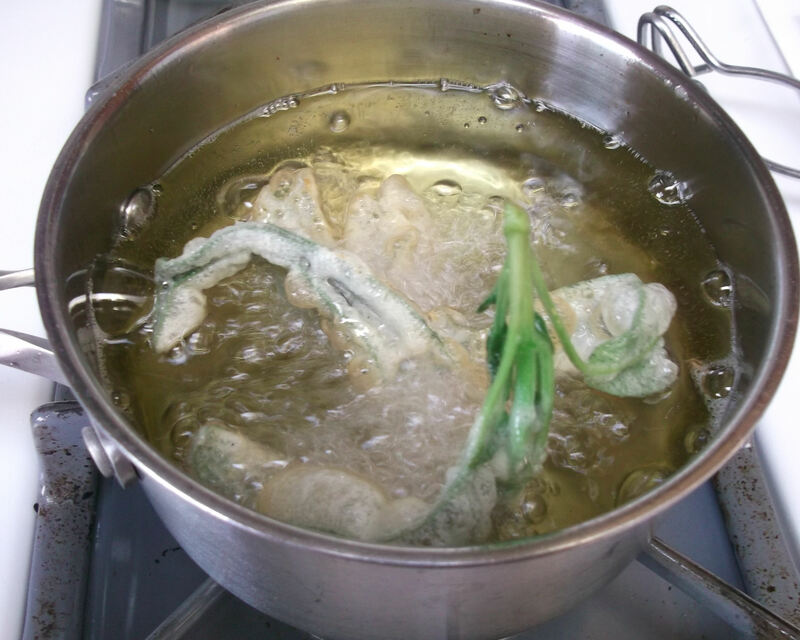 Just be sure to coat each leaf of the cluster with batter, and to fan the leaves apart in the oil so all sides get fried. Remove when lightly browned and drain on paper towels. 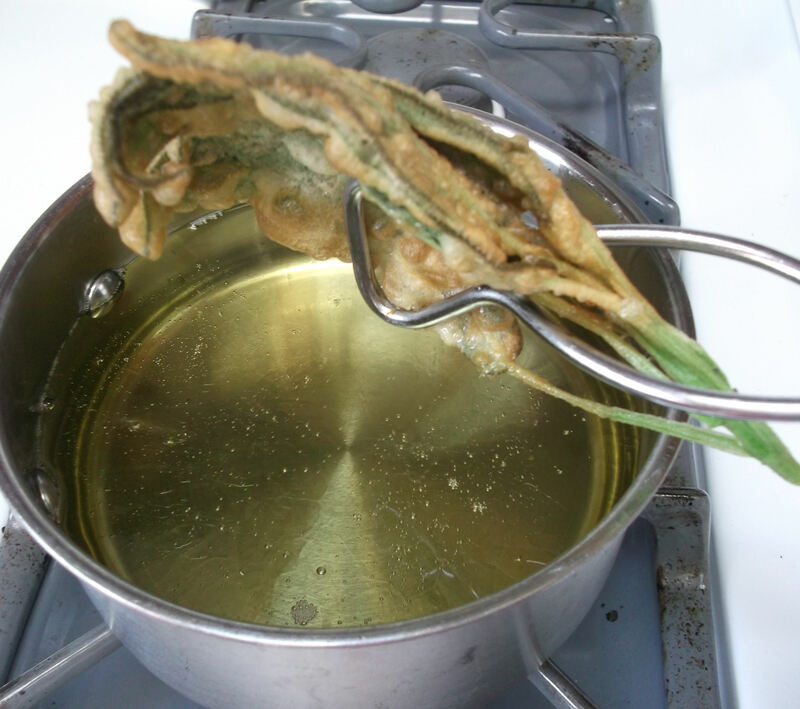 Taking out one leaf at a time gets to be time consuming, which is another benefit of frying them as a cluster. Keep finished leaves warm in a preheated oven until all are done. Serve immediately.